DISCLOSURE: I'll start out by disclosing that I do not work for Keurig and do not have any associations with the company. 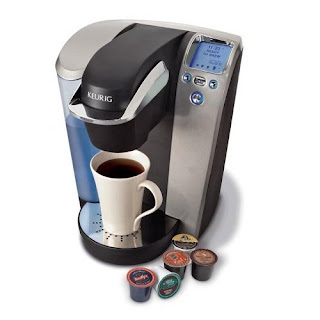 I did though receive a free Keurig B70 to use and review. All opinions are my own. Now that that's out of the way. I have to say I love having a Keurig! And that's not because I didn't have to pay for it. I actually wanted one of these for Christmas. But alas, it was a little too expensive of a gift. It's really simple to use. You fill up the water reservoir with filtered or bottled water. The machine heats the water. You put in a little K cup of your favorite coffee, tea or hot cocoa. Select the size of cup that you'll be using. And then press Brew and you're done! It's been a great way to try different kinds of coffee. I bought four variety packs to start out with. So far I haven't been disappointed. The Keurig works great for those times when you don't feel like brewing an entire pot of coffee. There have been numerous occasions when my husband would want some coffee and I'll say I'll have some too. But by the time I'm ready for that cup, the machine had already turned off and the coffee was cold. Other times, it's only one of us who wants coffee. The Keurig is perfect for that! Does it replace a regular coffeemaker? No. Sometimes it's nice to have just a big pot of coffee. Like on Sunday mornings, as you're reading the paper and having breakfast. But it's a great addition to have in the kitchen. Yes! Having a perfectly brewed cup of coffee from this Keurig is how I start each day! It just doesn't seem right if I don't have coffee from it. It's super easy to use and maintain. Great investment! How much does it cost? List price for the Keurig B70 is $229.99. I've seen it was low as $133.99 during special sales promotions and usually around $179.99. Where can I buy it? It's available at most department stores and mass merchandisers. Amazon.com has it for $169.